Temperatures are set to tumble this weekend in parts of the US with record low's expected in the Midwest and the Northeast with temperatures which would be average lows expected around New Year's Eve rather than early November. 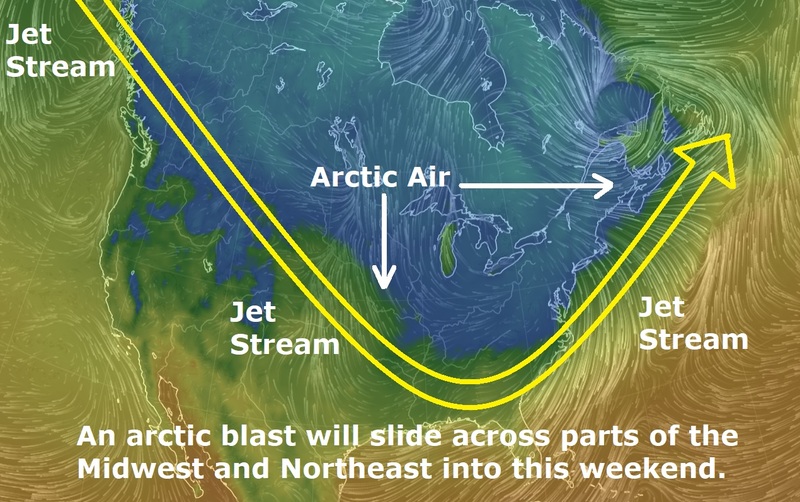 According to the Weather Channel, later this week, a pronounced southward dip in the jet stream will develop over the Midwest and Northeast, bringing the coldest air of the season so far, which could lead to record-low temperatures in some locations. That cold air will sweep through the Great Lakes and into the Northeast by Friday, where highs may hold in the 20s and 30s in some areas. Behind the arctic front, areas of heavy lake-effect snow are expected for a time in the northern Great Lakes, with a burst of light snow associated with the arctic front itself from the eastern Great Lakes into northern New England.